This post is a little belated, but I definitely remember this mac and cheese experience fairly well, because unfortunately it was rather disappointing. One of my favorite parts of visiting Disneyland is eating all the amazing food. On average, Disneyland and California Adventure boast some of the best dishes and snack foods around, so it ends up being about half the reason I fork out the money for a plane ticket. Unfortunately, the mac and cheese option at Cafe Orleans, located in the New Orleans Square area of Disneyland, was not very delicious. The flavor was pretty bland and the portion size was rather depressing, even for the adult sized. I suppose they try to make up for it with some veggie additions. But really, let's face it. 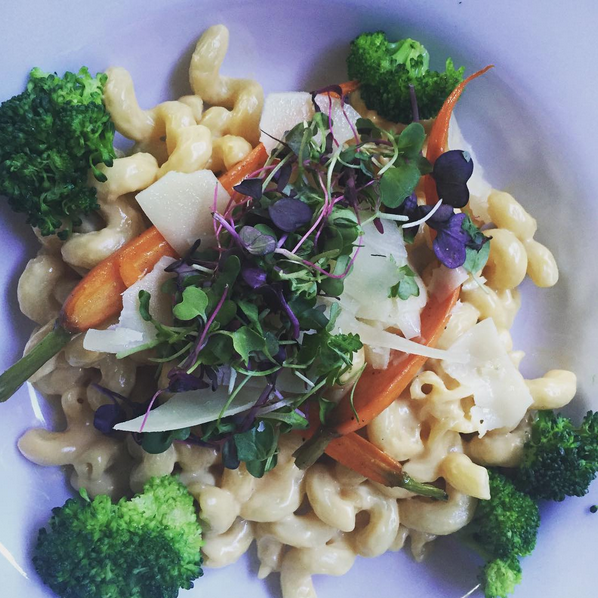 If someone's ordering a mac and cheese, they are probably not looking to have half of the dish be made up for with vegetables. That's just my two cents. If you do find yourself at Cafe Orleans, this might actually be one of the healthier options, which makes me laugh. For something really memorable and delicious, try the beignets, or if you are really hungry the Monte Cristo, which is basically a regular Monte Cristo but with beignet style fried bread. AH-MAZING.